May has come out against attacks from the former Labour PM. FORMER TAOISEACH BERTIE Ahern has ripped into Theresa May’s handling of the Brexit negotiations, saying that she had “no plan” when triggering Article 50. Article 50 is the legal mechanism which begins the process of a country leaving the EU and Ahern said she shouldn’t have used it when she did. Speaking on RTÉ’s Marian Finucane show, Ahern said that any sympathy he has for the British Prime Minister is on a personal level only. “I do have some sympathy for Theresa May, but only on a personal level. I watched her there being lambasted, she tried to make a speech the other day, she was exactly 50 seconds into it when they started heckling her,” he said. But apart from that, she created the red lines without consulting her own Cabinet, or even her senior Cabinet ministers. The Lancaster House speech, which she made in January of 2017, she brought the Customs Union into it for the first time, which I think was a terrible mistake. She called a general election after going for a walk in the hills over the Easter holidays and that was a costly hillwalk. She triggered Article 50 when she’d no plan, she didn’t have to trigger it, she triggered it a year and nine months ago without having worked out what the details of it was. Ahern went on to say that he’s “still worried” about Ireland’s position because “they game is still being played” and the backstop is under attack from Brexiteers. “All the debates during the week and the attacks on Ireland and the backstop. The Brexiteers and some others as well, I see Niall Fitzgerald, formerly of Unilever, a prominent Irish business person, and others are saying the backstop, we have to go softer on the backstop,” Ahern said. I think Theresa May was saying we should do the backstop for a year and others were saying that it should be just temporary. But I think it’s important from an Irish point of view, and I’ve supported the government on this, that the backstop has to stay if we want a frictionless border. It’s not something that we threw in just to have a word in the game.
.@theresa_may has condemned Tony Blair's call for a second referendum. The former prime minister told Sky News Mrs May should "switch course" and back a people's vote on #Brexit. The spat that Ahern mentioned between May and Blair saw the current Prime Minister accuse the former of insulting voters and trying to undermine her government with calls for a second referendum. “For Tony Blair to go to Brussels and seek to undermine our negotiations by advocating for a second referendum is an insult to the office he once held and the people he once served,” May said in a statement issued late last night. Blair, who was Labour prime minister between 1997 and 2007, then today accused the Conservative leader of being “irresponsible”. 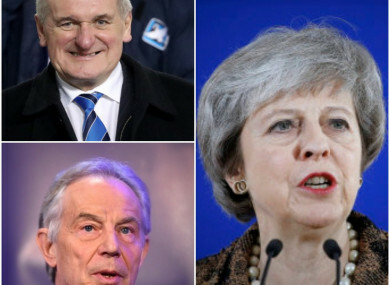 Email “Bertie Ahern and Tony Blair have both ripped into Theresa May's handling of Brexit ”. Feedback on “Bertie Ahern and Tony Blair have both ripped into Theresa May's handling of Brexit ”.